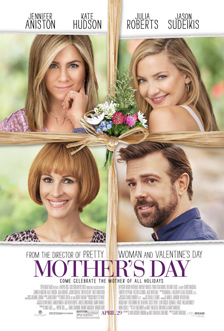 Watch the official Mother’s Day movie trailer, starring Jennifer Aniston, Kate Hudson and Julia Roberts. See the release date, cast and plot. MPAA Rating: PG-13 for language and some suggestive material. “Mother’s Day” is the latest star studded ensemble comedy from director Garry Marshall (“Pretty Woman,” “Valentine’s Day”). Bringing together Jennifer Aniston, Kate Hudson and Julia Roberts along with Jason Sudeikis, it’s a celebration of mothers everywhere. This big-hearted comedy invites us all to enjoy the laughter, tears and love as three generations come together in the week leading up to Mother’s Day.